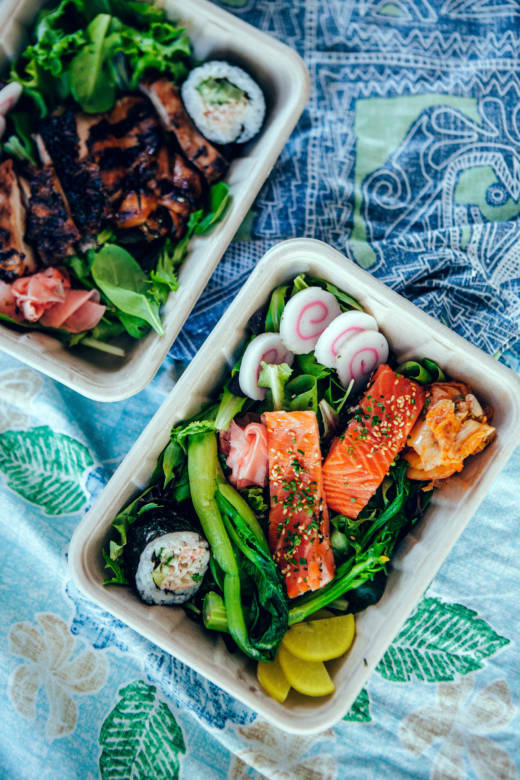 This week, I’m adding to your lunch options, which includes Aina’s Hawaiian bento boxes for delivery and One Market’s Friday BBQ lunches, plus an artsy and illuminated dinner at The Midway Gallery, a Northern Italian pop-up, and weekend feasting while flea market shopping at TreasureFest. Have you ever visited the charming Aina in Dogpatch? Chef Jordan Keao cooks with so much passion and finesse, and is a huge champion of Hawaiian tradition and ingredients, while creating his own modernized dishes with local and seasonal touches. 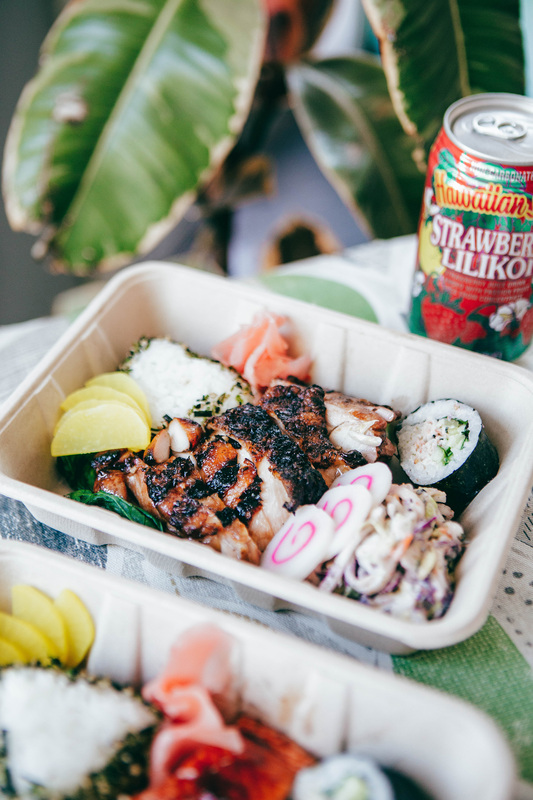 Starting June 18 through June 29, Aina is launching a special delivery-only pop-up called Aina Bento, inspired by the iconic Hawai’i plate lunch shops offering Hawaiian BBQ with Japanese sensibilities, plus influences from Korean, Filipino, Portuguese, and Chinese BBQ traditions. Exclusively through Caviar (use this code on Caviar for $10 to use for each of your first two orders with them), you can order dishes like Kiawe wood–smoked salmon with sautéed ginger, yu choy, steamed short grain rice, udon mac salad, pickled ginger, danmuji, and kamaboko ($14.50) or their BBQ kalbi with kimchi (with the same bento set-up for $15.50), plus other main dishes. And you can always order a side of Aina’s delicious musubi: Niman Ranch pork spam, glazed with kabayaki, molded with rice and nori ($3.50). Order during lunch Mon–Fri from 11am–1pm. Barbecue lovers, your Fridays just got nice and smoky! Chef Mark Dommen of One Market is back with their weekly Back Porch BBQ pop-up series. From June 1–August 31, you can come by from 11:30am–2:30pm on Fridays for a take-out or eat-in (which you’ll want to do since you can sit at picnic tables in their atrium area and get into a relaxed Friday frame of mind). 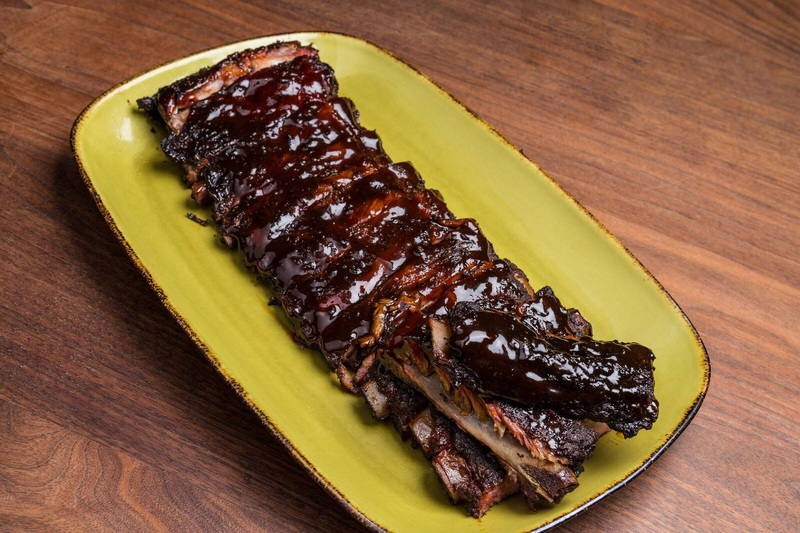 Menu highlights include St. Louis-style spare ribs, spit-roasted Mary’s chicken, 12-hour beef brisket, and a pulled chicken sandwich, as well as a selection of sides like Parker House rolls, potato salad, coleslaw, green salads, and desserts. Can’t leave your desk? You can also order on Caviar and use this code for $10 off your first two orders. Customers can also order Pitmaster Packages for larger parties. 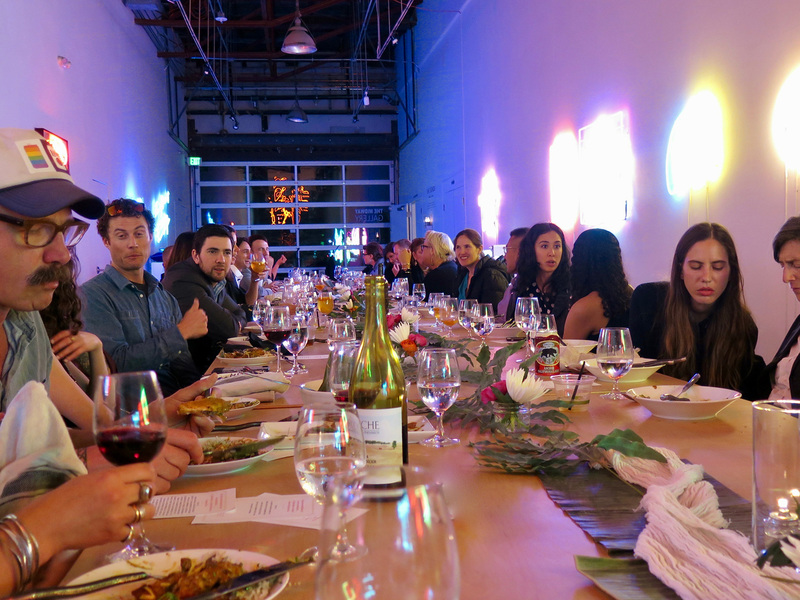 The Midway Gallery in San Francisco’s Dogpatch neighborhood has started a series of gallery dinners, where diners not only enjoy engaging, family-style meals from top SF chefs, but they are also surrounded with The Midway’s cutting-edge art installations—it’s truly a feast for the senses. On Friday June 22, the latest dinner will celebrate the new Halation exhibit, featuring the work of Christopher Schardt, an innovative LED artist widely known in the Burning Man community. Chef Telmo Faria (Uma Casa Restaurant) will be preparing bites for the reception (6:30pm) while guests enjoy viewing the installation, and then everyone sits down for a four-course meal at 7pm, with music from DJ Mario Tavares (Daybreak Sound). Dinner ends at 9pm, and guests are welcome to stay until 10pm to enjoy the art and music. Tickets are $85 per person, with cocktails, wine, and beer available for purchase at a cash bar. If you have any allergies, please share them when you complete your purchase and at least 72 hours before the event. The Treasure Island Flea has been transformed into TreasureFest, offering a monthly gathering over the last weekend of each month of flea market treasures (over 400 vendors! ), kid-friendly options, music, and entertainment, but another huge part of the festival is the food! 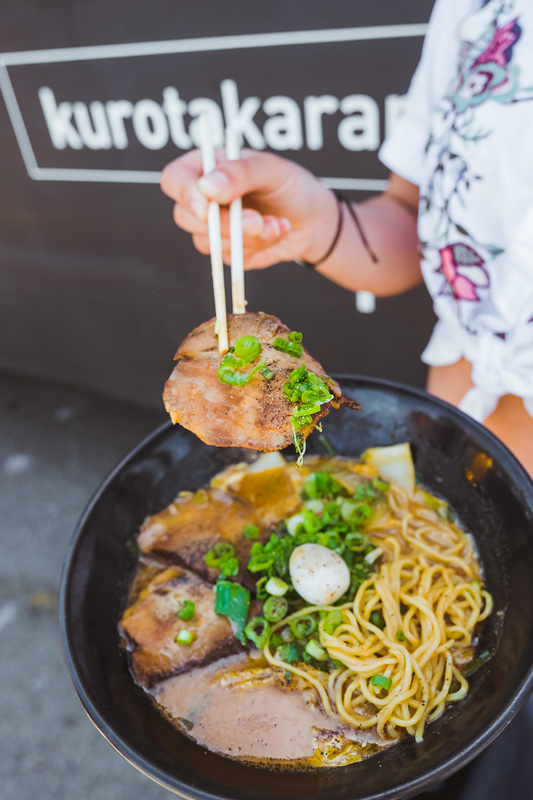 There are over 40 food vendors and trucks, ranging from favorites like The Chairman and Humphry Slocombe, to lesser-known vendors like Italian subs from Savourie Streets Truck and seasonal pie from Shampa's Pies. Plus there’s sangria. Bring your sunblock, tote bags and carts, and your appetite. And you can also bring your well-behaved doggie since the event is pet-friendly. Get excited for July, which will have a Hawaii theme. 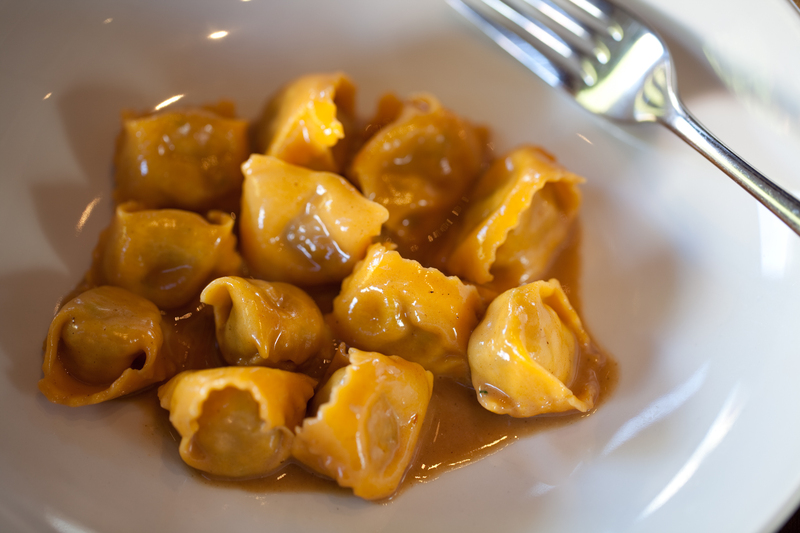 Visit rulli.com for reservations or call the Larkspur location of Emporio Rulli at 415-924-7478, ext. 3. Larkspur residents are more than well-acquainted with the Italian sweet treats at Emporio Rulli’s Pasticceria, but owner Gary Rulli has just launched something savory in the space as well. While waiting for his San Francisco restaurant, Ristobar, to reopen in the Marina in late August (it’s currently being retrofitted), he’s hosting a series of Northern Italian pop-up dinners throughout the summer on select weekends. The chef is Marcello Franceschini, who has spent the past three years in Italy working with Michelin-rated chef Massimo Camia in Piedmont—he was Ristobar’s sous chef working alongside Michele Belotti (who opened Belotti in the East Bay). The rotating menus are seasonal, and will even include vegetables, fruits, and herbs grown in Gary Rulli’s own Marin backyard garden. Menu items include two choices of appetizers like insalatina di polpo (octopus, green beans, fennel, celery, Taggiasca olives, toasted pine nuts, in a lemon dressing with an English pea puree) and pasta courses like their famed plin piemontesi (a decadent housemade pasta with braised meat filling, including veal, pork, rabbit, and spinach in a veal reduction and Parmigiano sauce—yes, it’s incredible). Second course options include Alaskan halibut with asparagus cream, hazelnut-flavored endive, and squid ink focaccia, or braised veal cheeks with sautéed potatoes and light eggplant parmigiana. Vegetarian options are also available. Of course, you’ll want to save room for dessert. Follow their Facebook page for future dates.